In brief: You need and deserve a higher degree of service from your pharmacy. HOW CAN I GET THE MOST BENEFIT FROM MY MEDICINES? Beacon can help you manage your medications with greater ease and consistency. We have ways to help you remember when and how to take your medicine, so it’s easy to follow doctor’s orders. WHAT IF I’M BEING HELPED BY A VISITING NURSE? We’ll work with your nurse or home health aid to make sure you follow the unique instructions for your prescription. We help simplify the task of taking your medications as prescribed. Absolutely, to your home or workplace. We can also send your prescriptions by mail if you leave the area—going South for the winter, for example. WHAT KIND OF SENIOR DISCOUNTS DO YOU OFFER? We have special senior discounts on top of our already competitive prices. Your discount applies to anything you buy from our pharmacy, including prescriptions, over-the-counter products, home healthcare supplies and equipment. WHAT IF MY FAMILY IS HANDLING MY FINANCES? We’ll help you set up a house account. You can name a third-party—a family member, for example—to deal with the finances. 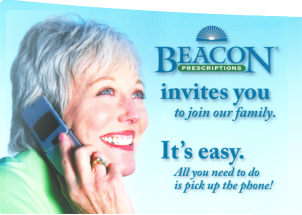 WHAT MAKES BEACON DIFFERENT FROM OTHER PHARMACIES? Because your Beacon Prescriptions pharmacist owns the business, our pharmacy is focused on your health, 100%. That means you get the most important service of all: Time. Ask as many questions as you want. Our knowledge and attention to detail offer you a whole new level of service. With so many fertility medications available today, couples and their physicians look for a pharmacist with expertise. Your Beacon Prescriptions pharmacist has that in-depth knowledge and experience. Bring us your questions. We can help demystify the complexities of fertility medicine. What makes Beacon uniquely qualified to help? We’re fertility prescription specialists. We stock the medications most pharmacies have to order, including progesterone suppositories and injections. So if you’re looking for the latest advancements, look to Beacon first. Your Beacon Prescriptions pharmacist is also an expert in drug interactions — in fact, we conduct a guaranteed check for them. With your health and medication history at hand we double check to help you avoid problems when taking more than one prescription. We will double check for adverse reactions. We offer the lowest prices you’ll find anywhere in central Connecticut. For your convenience, we also accept VISA, MasterCard and Discover cards. Can you help us with insurance issues? Yes. Our staff will verify your insurance coverage and bill your insurance company on-line. We’ll even work with your physician’s office when prior authorization is required by your insurer. That’s one less concern for you. How can we order prescriptions? Order by phone or fax, and your prescription will be ready when you get here. You can also reorder your prescriptions online. We can also arrange for early-morning or after-hours pick-up. Or just walk in and we’ll fill your prescription immediately — almost always in 10 minutes or less. Yes. We will ship any order for a nominal charge. Your Beacon Prescriptions pharmacist owns the business, so our pharmacy is focused on your health, 100%. That means you get the most important service of all: Time. Ask all the questions you want. That’s why we’re here. After all, when you’re expecting, you’re also expecting the highest level of knowledge, compassion and service. You’re looking for an authority on fertility medication. Please contact the Southington location for fertility medications.